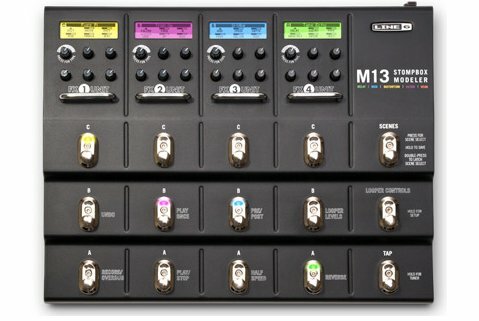 With over immortal modern and vintage stompbox effects, M9 Stompbox Modeler provides the brilliant tones, old-school simplicity and necessary portability to be the all-in-one stompbox solution for every guitarist. Packed into this tiny box (about the size of a DL4 Delay Modeler) are all the effects from best-selling Line 6 pedals and rack units: famous sounds from DL4, DM4 Distortion Modeler, FM4 Filter Modeler, MM4 Modulation Modeler, Verbzilla, Echo Pro and more. Use up to three of these great-sounding effects simultaneously, and you can create 24 different pedal board “scenes” to switch between easily. Inspired by the simplicity of classic stompboxes, M9 Stompbox Modeler is incredibly easy to use. Tweak your tones on the fly using the dedicated knobs and easy-to-read LCD window. Just turn the knobs and you’re done. And your teaks remain, even after you power down. The Line 6 M9 even comes with a full-featured 28-second looper, M9 Stompbox Modeler allows for extended in-the-moment looping. It has all the necessary looper controls via dedicated footswitches: Record/Overdub, Play/Stop, Play Once, Undo/Redo, Half Speed, and Reverse. All the ins and outs you’ll need are there. You’ll find ¼” mono/stereo ins & outs (with True Analog Bypass or DSP Bypass). There are two ¼” expression pedal jacks to morph smoothly between tones. There’s even MIDI in/out. And the unit is built tank-tough with all-metal construction, created to withstand constant stomping. Together with its built-in chromatic tuner, M9 Stompbox Modeler’s generations of sonic treasures and brain-dead simple design will prove indispensable (not to mention highly addictive).